(Photo: Young Kun Park / Ecumenical News)The Rev. 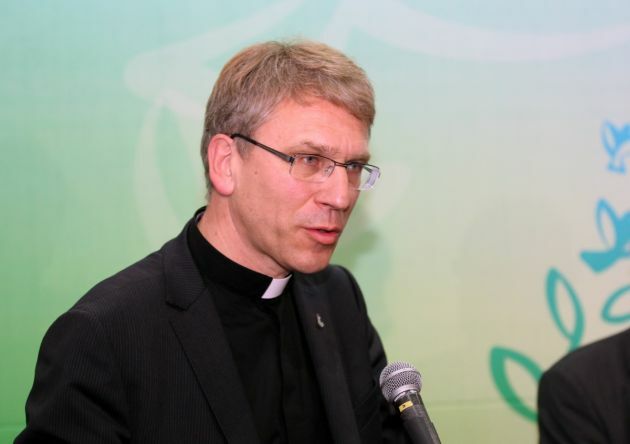 Olav Fykse Tveit, General Secretary of the World Council of Churches speaks during a press conference during the 10th Assembly of the WCC in Busan, South Korea on October 31, 2013. World Council of Churches general secretary Rev. Olav Fykse Tveit has represented faith based-organizations at a high-level New York breakfast hosted by the UN agency dealing with children's rights and needs, UNICEF. During the week UNICEF (United Nations Children's Fund) week invited 20 of its major partners from the private sector and civil society to commemorate the 25th anniversary of the adoption of the Convention on the Rights of the Child. At the November 20 meeting a key group of major UNICEF partners engaged in dialogue with Nobel prize-winning economist Joseph Stiglitz on the theme of equity and children's rights, the WCC said in a statement from its headquarters in Geneva. "To believe that God created all of us, means also that God wants all children to continue to be created and sustained and for them all to have the same opportunities," Tveit said in his presentation. "To ignore the rights of girls and boys, and to accept inequalities among children, is to ignore the peace and justice of God." The WCC general secretary noted that churches offer access to education and health care and in many part of Africa churches are primary health care providers. "But there is much that needs to be done in our faith communities," Tveit said. "Therefore, we also need to commit to the rights of children - and to work with international partners like UNICEF." He noted, "I also said that the question of equality is a genuine moral and theological question. And I emphasized that the question of children's rights is about all of us. As a grandfather this has become clearly evident to me." On the 25th anniversary of the Convention on the Rights of the Child, the State of the World's Children report presented an agenda for change. The United Nations General Assembly adopted the Convention on the Rights of the Child in 1989. Since then, advocacy for advancing child rights has made immense progress. There has been a huge reduction in the numbers of children dying before the age of five, and there is increased access to education and clean water. The World Council of Churches promotes Christian unity representing more than 500 million Christians from Protestant, Orthodox, Anglican and other traditions in over 140 countries. The Roman Catholic Church is not a member of the WCC, but the two church bodies work together on many issues. During his visit to the United States, the WCC general secretary met other leading UN figures including: Olav Kjørven, Director of the Public Partnerships Division, UNICEF; Cynthia Scharf, UN Secretary-General Climate Change Support Team; Victor Kisob, Director of the UN Ebola Response Liaison Office; Rev. Jim Winkler, General Secretary of the NCCC-USA; Shaun Casey, Special Representative, Office of Faith-Based Community Initiatives, U.S. State Department and Jens Toyberg-Frandzen, U.N. Assistant Secretary-General ad interim for Political Affairs.